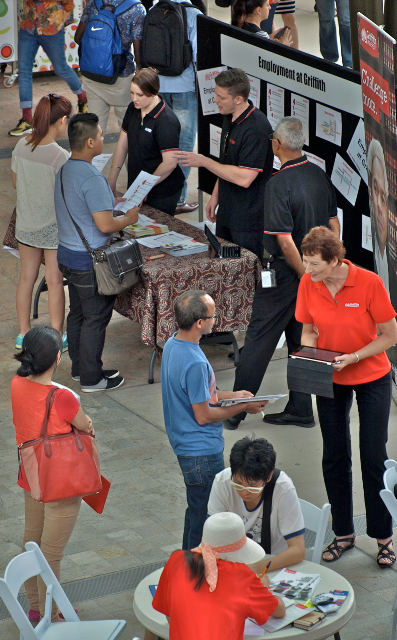 As part of Griffith University’s Careers Month extending throughout March, the CareerFest at Nathan campus was an excellent opportunity for students to explore options for employment beyond university and pick up some great tips about how to work towards their dream career. Australian Defence Force Recruiting to feed the hoards of hungry students. Though CareerFest events were highly valuable to the entire student body, I found the event particularly informative as a final year student beginning to prepare for graduate employment in my field of study. As I moved around campus there was an abundance of knowledgeable staff onsite, ready to assist with student queries. Also popular was the Resume Rescue stand, where Career Leaders provided assistance and suggestions for resume development and improvement. Plus, the Graduate Opportunities kiosk was well worth a visit – the comprehensive graduate jobs directory that was available contained a wealth of valuable job application and acquisition advice. However, CareerFest went far beyond informative stalls. The team at Myer Mt Gravatt put together a ‘Professional Wardrobe’ fashion show, offering stylish ideas for presentation in job interviews and the workplace. External professionals also took the time to share their knowledge and experience in workshops covering topics including interview tips, personal branding, and graduate employment within the Queensland Government. For me, the CareerFest was a highly informative event that really opened my eyes to the wide world of potential graduate opportunities and highlighted some areas for development. A special thank you to Griffith University and the Careers Team for organising the event and all staff and workshop facilitators who took the time to share their expertise with students. All photos were provided by Bill McCulloch.